In the wake of early season trades and the Wizards announcing they want to blow things up, let’s assess a similar team, the Minnesota Timberwolves, and their most interesting player– Andrew Wiggins. After trading away their “best” player Jimmy Butler for the good of the team, the T-Wolves may have to assess if their team as currently constructed will lead to long term success. Before we get to four potential trades, let’s examine Andrew Wiggins’ good, bad, and excuses. Starting with the positives, Wiggins is only 23 years old. It’s often cliche to exclaim youth as a positive, but it still garners the idea of player potential. With Wiggins entering his 5th year and seeing the success of players such as Jayson Tatum, Donovan Mitchell and Luka Doncic, it’s hard to argue patience, but 23 is still fairly young for an NBA player. On top of being young, Wiggins is quite athletic. Even by NBA standards he is still an elite athlete and that will overcome some of his flaws. The other positives are his ability to shoot corner 3s. Last year, Wiggins shot 43% from the corner, but took less than one attempt per game. He also has great durability and health– missing just one in his first four years. Health is often overlooked when assessing talent and a players ability to be consistently on the floor can not be undersold. That contract. Five years, $147 million. Wiggins is in the first year of his monster contract and is struggling to live up to it. He’s tied for the 21st highest paid player in the league. The below image shows some of the other players being paid around the same amount. The difference is with length it maybe the worst contract in the NBA– except maybe John Wall‘s, whose contract is much more expensive with a trade kicker. The Wizards incompetence helps the T-Wolves fly under the radar on this one. If you can overlook the glaring flaw that is the contract, unfortunately there is still a decent amount of bad. Wiggins has been a defensive liability. His on-ball defense has been adequate, but his off-ball defense has been so poor that he has been rated as one of the worst defenders in the league by advanced defensive metrics. On top of that, his shooting has been inconsistent and at other times flat out terrible. Since Butler’s departure, the team has won seven of ten, but Wiggins has shot just 32.8% overall. For his career, he has shot 44%, which in itself is not at the level his contract demands. 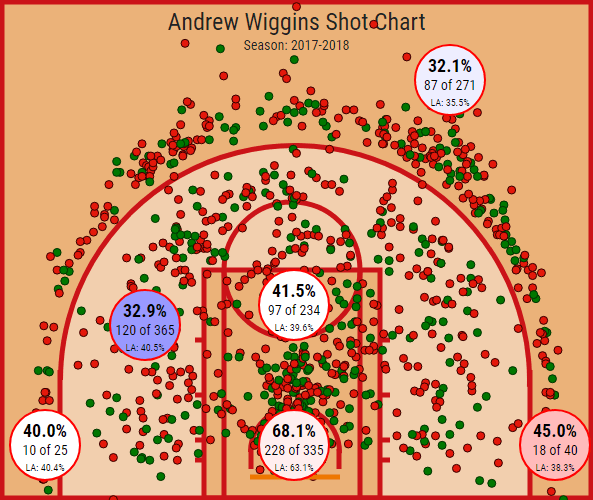 The below shot chart from 2017-18 shows that Wiggins attempts a majority of his shots from mid-range, shooting only 32.9%– 7.6% below the league average. A lot of things that Wiggins does doesn’t show up in the box score. He often is heading down the court while the big men go for defensive rebounds. He’s not a primary ball-handler, so he won’t have many assists or assist opportunities. The offensive system doesn’t seem to favor Wiggins. For most of his career he has had poor defensive teammates that don’t help his team defense. On top of this, Tom Thibodeau‘s defensive scheme is outdated. After all gathering all this information, it’s difficult to see Wiggins being dealt. He doesn’t appear to be on the rise — he’s struggling this season — and his contract is very unattractive. To trade Wiggins, Minnesota will have to target a desperate team or offload a draft pick or two. The reason this might work is that Wiggins may thrive in a ball movement scheme with “Heat culture.” The contract is another four years, making the risk factor high and may require offloading a pick. The T-Wolves could use some rim protection that helps keep Karl-Anthony Towns out of foul trouble. Whiteside also is a little cheaper and is off his contract by 2020. Pat Riley, however, has never seemed to value draft picks highly and trading Whiteside for a project with Wiggins may not be what he wants to do in what seems like the potential end to his career. Andrew Wiggins, 2019 & 2021 top 8 protected 1st round pick to Washington for Otto Porter Jr. The Wizards have been looking to blow it up. Removing an underperforming Porter Jr. from their books would work out nicely for them, but Wiggins is a similar price for two years longer. Porter also has a 15% trade kicker, but his perimeter defense and three-point shooting would really help open the floor for Robert Covington. He could also be a great role player to fit alongside Towns. Beal is currently the Wizards’ most valuable asset and was rumored to have been in trade talks for Butler. To trade him away for a lesser player in Wiggins, the Wolves would have to send picks completely unprotected, but even then they might not have the best offer for Beal. Adding Gibson on an expiring contract for Mahinmi may help tilt it in the Wolves’ favor. If the Wizards continue to lose, Beal may finally get his trade wish. This may sound odd to trade for Andre Drummond when you already have Towns, but this would allow KAT to play more outside the paint and you can stagger their minutes. He has real added value on the both offensive and defensive side of the ball. 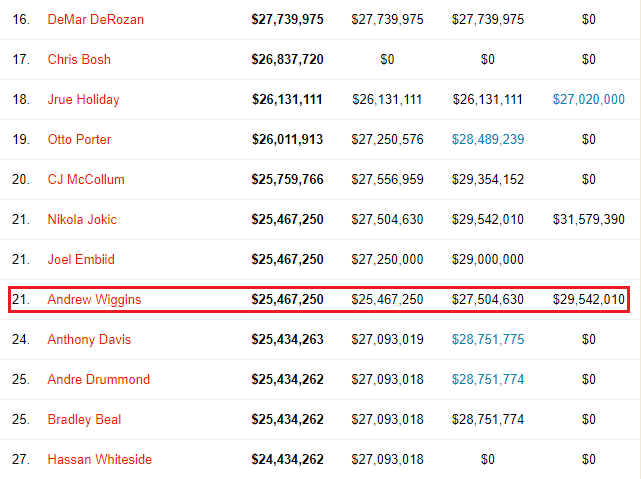 Wiggins will be hard to trade without giving up future assets. He’s currently having his worst year shooting so far and is lowering his trade value every game. The Wolves’ best bet might be to hope he reaches his potential down the line. This, however, may mean the Wolves are playing for 2020 and beyond. Next Story → Should Minnesota Target Beal?